0.1 Forgot your Mi Account Id Password? 1 What is Mi Account Unlock Tool? 2 How to Download and Install Mi Account Unlock Tool? 3 How to Remove Mi Account Verification using Mi Account Unlock Tool? Download Mi Unlock Tool:- Want to bypass the Mi account or remove/reset mi password? Then, Mi unlock tool is the best option. Download and use Mi Account Unlock Tool on Windows PC. Mi Account Removal tool or Mi Account Unlock Tool is 100% working fine. So, you owned a Mi device and also impressed with their Mi Account services. The great thing is that with one account, you can perform multiple actions. For example, your Xiaomi device lets you use your Mi Account. That Mi Account can be used for synchronization of all your Xiaomi mobile data like messages, contacts, audio, photos, videos, notes and much more. Summarizing, using their Mi Account service, you can quickly and efficiently use their cloud services. Not only that, Mi is known for the best mobile services on the planet Earth. As of now, you can also find your lost Mi smartphone. If you forgot about your phone’s location, then Mi Account stands to be a best-helping hand in that case. Even, if your phone is theft, then you can wipe your whole smartphone’s data very easily remotely. Another thing is the continuous alarming option that must be used to find your Mi smartphone. Though, if you recently bought a new Mi smartphone, then you don’t need to waste your time in transferring your contacts, videos, messages, audio, photos from your old Mi smartphone to your new Mi smartphone. You can sync contacts, notes and more to your new Mi smartphone using your Mi Account. 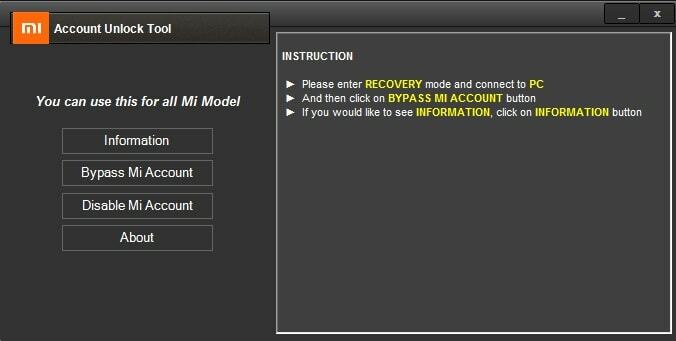 Forgot your Mi Account Id Password? In case, you have factory reset your Mi smartphone recently and trying to login to your Mi Account to get access to Mi cloud services. Wait! Don’t remember your Mi Account id and password? Then what should you do? Don’t worry guys ever! You can use Mi Account Unlock Tool or Mi Account Remove Tool to bypass the account verification. Are you worried about the lost warranty? Don’t worry because your Mi device’s warranty will not be void while avoiding account verification using Mi Account Unlock Tool. As already discussed, Mi Account Unlock Tool is a great software to Bypass account verification in your Mi smartphone in case if you don’t remember the mi account id and password. This tool can be used on most of the current and upcoming Mi smartphones. All, you have to do is download the Mi Account Unlock Tool from below provided link and follow the below featured guide to use Mi Account Unlock Tool and bypass the account verification in your Mi smartphone. This application software is compatible with almost all Windows versions. So, if you are holding a Windows PC rather than Mac OS then what are waiting for? This tool called Mi Account Unlock Tool is compatible with Windows XP/ Vista/7/8/8.1/10. Once you download and installed Mi Account Unlock Tool, then you can easily bypass account verification in your Mi smartphone. All you have to do is read and follow below guide completely. Here, you can download the Mi Account Unlock Tool or Mi Account Remove Tool and bypass the mi account verification in your Mi smartphone without voiding its warranty and ahead, very quickly. Make sure to have a good working internet connection to feel the flawless downloading. The Mi Account Unlock Tool or Mi Account Remove Tool has a size of approximately 4.4 MB. How to Download and Install Mi Account Unlock Tool? 1. First of all download Mi Account Unlock Tool or Mi Account Remove Tool from Download Section. 2. Wait for a few moments to get the Mi Account Unlock Tool, or Mi Account Remove Tool file gets downloaded completely. 3. Once downloaded, double-click on the download .zip file. 4. Now, click on the run to install the file on your Windows PC. 5. Now, follow the on-screen instructions to install Mi Account Unlock Tool or Mi Account Remove Tool on your Windows PC. 6. Once, the file gets installed on your Windows PC, you can follow below detailed instructions to use Mi Account Unlock Tool or Mi Account Remove Tool and Remove the account verification. How to Remove Mi Account Verification using Mi Account Unlock Tool? 1. First of all, make sure to have downloaded and installed Mi Account Unlock Tool or Mi Account Remove Tool. 2. Now, power off your Mi smartphone. 3. Once power off done completely, press and hold the power button + volume up button. 4. Here, you will find a Mi logo appearing on your Mi smartphone’s screen. 5. Here, you have to release the power button. Make sure not to release the volume up button. 6. Now, select the recovery mode option on your Mi smartphone then release the volume button as well. 7. Here, bring a USB cable. 8. Now, connect your Mi smartphone to your Windows PC using the USB Cable. 9. Now, head over to the Mi Account Unlocks Tool folder. 10. Here, right click on Mi Account Unlock Tool.exe. 11. Now, select the option called Run as Administrator. 12. In Mi Account Unlock Tool, click on the information tool to check your device is connected correctly to your Windows PC. 13. Here, click on the Bypass Mi Account option. 14. Sit back and relax. Here, your device will restart automatically. 15. Wait for a few moments. Have patience. 16. Congratulations! You have successfully bypassed account verification in your Mi smartphone using Mi Account Unlock Tool or Mi Account Remove Tool. We hope this article helped you. Don’t forget to comment below guys if you have any questions and feel free to ask if you find any problems while downloading, installing or running Mi Account Unlock Tool or Mi Account Remove Tool app on your laptop/PC running Windows 10/8.1/8/ 7/Vista/XP. Also, let us know if you find any problem while bypassing account verification using Mi Account Remove Tool or Mi Account Unlock Tool. Also, comment below if you know about any other best method to bypass Mi Account Verification. Make sure to share this important article with your friends. Have a nice day. TechVictoria! !